Precision Energy Meter (WattsOn – Mark II) – AYA Instruments, Inc. Ideal for Energy Management, Solar, Export Limit, Building Automation and OEM Applications. 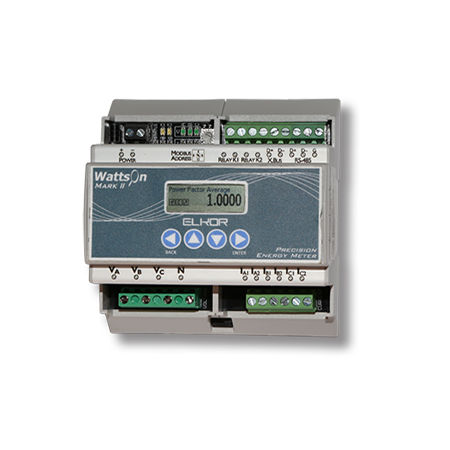 The WattsOn-Mark II Precision Energy Meter uses cutting-edge metering technology to provide unprecedented accuracy, resolution and metering performance for any electrical installation. 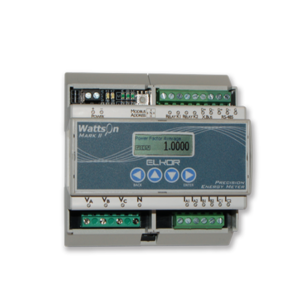 WattsOn monitors each phase individually and incorporates the functions of single-phase, split-phase, and three-phase meters. 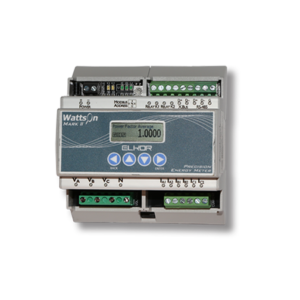 The WattsOn-Mark II Precision Energy Meter utilizes advanced metering technology to implement a multi-function power and energy meter into a small, cost-effective package. 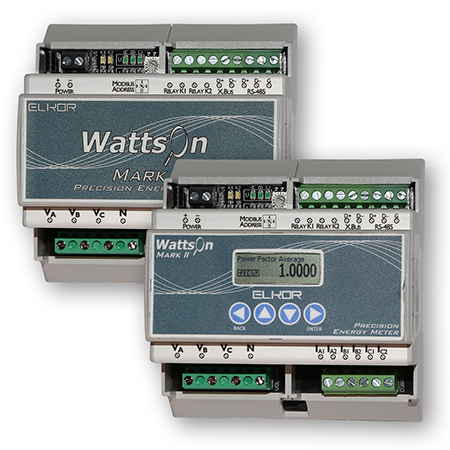 WattsOn-Mark II provides a unique solution for monitoring virtually any wiring installation including single phase, split phase and three phase loads. It accepts up to 600V (line-to-line) directly, without the need for potential transformers. It may be configured for use with industry standard 5A CTs, 333mV CTs, mA CTs (such as Elkor’s line of safe mA split and solid core CTs) or Rogowski Coil flexible CTs. The WattsOn-Mark II offers full four-quadrant metering. All parameters are metered and accumulated on a per-phase basis. Instantaneous power (W, VA, VAR) feature a high update rate (100ms), other parameters are updated every 500ms. The high sampling rate, true-RMS inputs may be used even with distorted waveforms, such as those generated by variable frequency drives and SCR loads, up to the 30th harmonic. The meter provides comprehensive per phase data, including Volts, Amps, Real Power, Reactive Power, Apparent Power, Voltage Angle, Power Factor and Frequency, Quadrant, Import/Export/Net Wh/VAh and per Quadrant VARh. All models include Ultra-High Resolution and Dynamic Range. This feature allows mA input meters to be user configured and no longer requires the CT model and ratio to be specified at the time of ordering, simplifying meter and CT selection. The wide dynamic range of the current inputs ensures high accuracy and resolution even at very low measurements. Precise CT ratios and phase compensation may be field programmed for ultimate accuracy. Additionally, the meter may be configured with individual CT ratios per-phase, allowing for metering asymmetrical loads such as individual building branch circuits. Measurements are available via the RS-485 output port (Modbus/RTU or BACnet MS/TP). 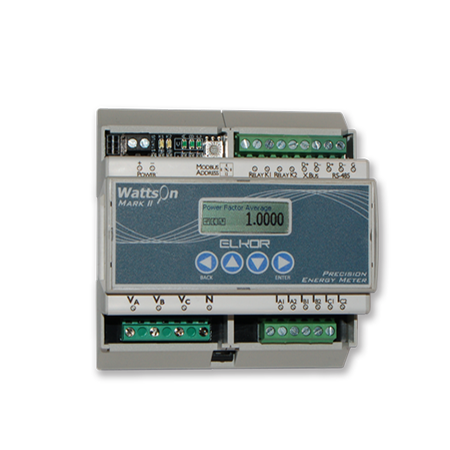 In addition, two solid-state relay outputs are provided and may be software configured for pulse, status or alarm triggers, on any measured parameter. An on-board graphic LCD display, real-time clock and data logging are available as an option. The meter may be optionally equipped with an integrated BACnet/IP gateway, or an ETnet (Ethernet module providing Modbus/TCP, web server, as well as HTTP post capability).